Posted on February 26, 2018 at 9:00 am. 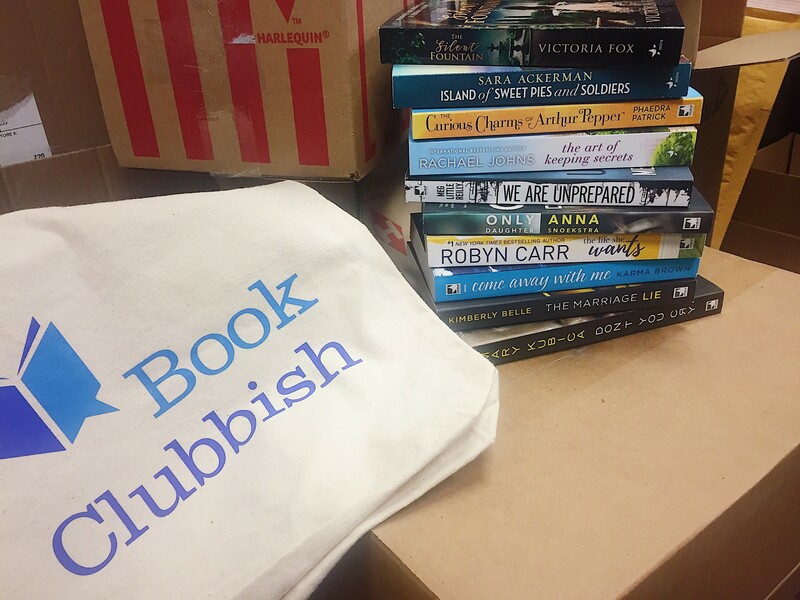 Any book lover who has ever had to move into a new home knows the struggle of packing up bookshelves, and the BookClubbish office is no different. We’re clearing out our shelves as we get ready to move to a fancy new location next month, and we want to send one of our book boxes to you! Tell us what books have traveled with you through the big moves in your life in the comments below for a chance to win. Giveaway: Answer the above question for your chance to win an amazing BookClubbish prize pack. Open to residents of the US and Canada, excluding Quebec. Contest closes March 5, at 11:59 p.m. ET. One (1) winner will be selected from all on March 6. For full official rules, click here. Update This contest is now closed. I was a renter so moved many times along with my books. I have always packed my favourites – To Kill a Mockingbird, Anne of Green Gables, Little Women and many more. I unfortunately have never left books behind. When moving they always went with me. Whether Jane Austen, Lewis Carroll, Robyn Carr or My Bible I have to read. Books are life to me! I love classics, history, biographies, Christian Romance, fiction, My Bible. I moved multiple times while attending Uni. Pride & Prejudice, Emma, LOTR always went along with me. The Little House on the Prairie series went from California to North Dakota and back. Jane Erye also made the move. Jane Austen books I bought in Europe and a book my dad bought me called the passionate pen. Our bookshelf now is filled with books from my past, my husbands and now our daughters. Our last move was many a long time ago but I brought my first four books in the Outlander series. I still have them and have read them many times. I also have Gone With the Wind and some of Judith McNaught’s early books Almost Heaven, Perfect and Paradise. Family bibles definitely and souvenir books from my travels. I haven’t moved in year but when I do, all my books will go with me – we’d better rent a whole truck just for them! My Bible of course but also …To Kill a Mockingbird , Great Expectations, The Princess Bride, Harry Potter Series, Into The Wild, The Complete Stories is A.A. Milne. And a very special copy of All that Heaven Allows that was my grandmothers! I moved 6 times in five years before. I could never leave my Nicholas Sparks , Jodi Picoult or Elizabeth Berg books. I love them all! I have too many books to list. They all came with me during our last move. We might be moving again soon, and I have accumulated hundreds more. They will all come with me to our next house. We moved to KY 5 years ago. We had unloaded the truck we thought but when we went back to the truck, over 40 boxes of books remained. So I have to say that ALL my books moved with me. When I move, I take all my books with me. They give me comfort and take me to another time and place. I have some classics like To Kill a Mockingbird and Catcher in the Rye that always come with me as well as Nights in Rodanthe and Nineteen Minutes to name a few. I’ve moved several times in my life, and I always keep all of my Dean Koontz books. I always take a few special books with me during big events in life. I always take my set of Little House on the Prarie books, and my first edition copies of the Outlander series. Those are the books that really affected me as a child and as an adult. I have moved large numbers of boxes of books. Half are with me in my apt and the other half pus are stored in my son’s house. When I was little, we had the complete set of “Uncle Arthur’s Bedtime Stories” and I loved them. When I got married and moved out, my mom let me have the set. The books have moved with me to three locations. I have also moved with A Secret Garden, A Little Princess, Pride and Prejudice, and Anne of Green Gables… my classic favorites! I have always had a ton of books to move with, and have never considered it a reason to down size. Being surrounded by books makes me happy. I may choose to thin out my books from time to time for other reasons though. I’ll never leave behind my Suzanne Brockmann and Kelley Armstrong books! I have had the same copy of The Diary of Anne Frank since I was 11 and it has moved everywhere with me for over 50 years. I moved all my books. I have all of Stephen Kings Books. All of them. I can’t get rid of my books. We’ve moved at least 8 times. I don’t reread many fiction books, but I have poetry books and some other nonfiction books for at least 20 years. I haven’t moved in 30 years, but I still have my “Children’s Classics” from childhood, the copy of Gone With The Wind that I devoured in the summer of my 13th year, and my high school freshman Algebra book. Although we have several bibles (new editions, etc) I still have my first Bible given to me 60 years ago. I have a bible that my mema and papa gave me at Christmas. Debbie Macomber, Anthony Trollope and his great niece Joanne Trollope. I know I moved my Bible, but it’s been 38 years since I’ve moved and can’t remember if I brought any other books. My original set of The Hobbit and The Lord of the Rings!! Judith McNaught, Julie Garwood, Jude Deveraux, Sandra Brown, Amy Plum, Kat Martin, Nora Roberts, Robyn Carr. Well that’s a few of several, several authors that come with me. My entire library of books is packed up right now in about ten 20 gallon totes in a storage unit. I have so many books I can not recall the names of all of them but I do know some of my favorites. Like my Harry Potter collection, Dean Koontz collection, V.C. Andrew collection, among others. I haven’t moved in over 40 years ! I have a room in my house that has an entire wall of bookshelves & they still don’t all fit ! I’m hoping I never have to move so I wouldn’t have to decide what to keep. I love cozy mysteries as well as a good thriller. Have lots of DIY books and self help as well. I’m never without a book in my hand. Just moved and I made sure to bring my books that I revisit again and again, including Pride & Prejudice, Emma, Bridget Jone’s Diary, among many, many others! The Lovely Bones. That books has travelled to every home I have lived in since college…. I have a shelf full of books that I can’t go without. So many favorites that I could mention. Mostly Jude Devereux and Nora Roberts but a nice mix in of classics too. Where I go my books go! I have brought all my college Shakespeare classics with me for the past 10 years. That’s at least 6 moves! I haven’t had to move in nearly 30 years, and I mostly read historical fiction. If I had to choose 1 book to take with me if I had to move, I would choose “The Signature of All Things” by Elizabeth Gilbert. When I moved in my home country all of my books moved with me. But when I moved to Canada I took along my Agatha Christie collection, The Little Prince, Mary Poppins, The 100 year-old man who climbed out of the window and disappeared and my Tove Jansson collection. All of my books came with me. Even on my most recent move from a house to a condo. My Diana Gabaldon Outlander series and my Janet Evanovich Stephanie Plum books have moved with me each time!! Nora Roberts, Jayne Ann Krentz, Linda Howard, John Sanford, and James Rollins move with me everywhere I go. I used to hoard books, but kept the majority of them boxed in the basement. And then, the basement flooded and I had to toss over a thousand books. Since then, I’ve only replaced a couple of my favorites: Travels with Charley in Search of America by Steinbeck, The Little Princess by Burnett, and Little Women. All classics in my mind. My Bible given to me by my late parents and my Outlander series come with me always. I don’t really purge many books when moving. All Jane Austin’s books have moved with me since the 1980’s! Plus my childhood collections of Nancy Drew and Anne of Green Gables series. Gone with the Wind, all of my Stephen King books. and my Agatha Christie books have made every move with me. My family has moved six times since 2010. Luckily my husband loves books as much as I do and hasn’t complained too much about the stacks and stacks of wine boxes filled with books. But it’s hard to part with old friends. Especially my shelves of books written by and about Jane Austen. I still have some of my Nancy Drew and Little House on the Prairie from when i was a kid. My collection just keeps growing. ALL my books have made the moves with me, but i hope i don’t move anytime soon…..so many books would need boxed up. And those boxes are heavy! All of my childhood classics: Anne of Green Gables, Nancy Drew, etc.! We move on average every 12 months and often those moves involve new countries or at the very least new provinces. So generally the classics come with us while the other non-fiction or fiction books stay. We stopped at a garage sale in the US on a road trip and my daughter was pleased to pick up a huge selection of Nancy Drew books. We drove from Texas to New Brunswick and they came with us – over a dozen of them. We have moved a lot. Since getting married in 2009, my husband and I have moved 5 times. Before marriage, there were several other moves. I have a hard time letting go of books. My poetry books have always moved with me, as have my first edition Harry Potter books and my signed books. All if my favorite children’s books have traveled with me. I needed to have them around when my children came into this world. We’ve read them over and over again and I will keep them so I can pass them along, once they become parents. Oh dear, I’ve lived in the same house over 40 years and I give my books to friends after I’ve read them. When they’re returned, I place them in the library at Chautauqua Institution. I am holding onto ANGRY HOUSEWIVES EATING BON BONS, THE OTHER BOLEYN GIRL and THE NIGHTINGALE. My husband is in the military and we move a lot so I’m trying to be most digital with my reading. While I have few favorite books I keep, I like to give away my paperbacks or hardcovers to friends I meet who love to read. I always pack up my books very carefully. My Stephen King books, and V.C. Andrews books are special to me. Along with my ereader also. I love books, and read whenever possible. I have a set of Disney books that I received when I was very small. I think they were from a book of the month club. Those have made every move along with me. The rest of my books I prefer to pass on to someone that I think would like them – share the love. I have been collecting JD Robb’s In Death series…those books move with me. I’ve kept all my books since I was young – to share with my children. I have a couple of boxes of Nancy Drew and Trixie Beldon. I also, in my lasr move kept my collections of Kathy Reichs, Brenda Novak and James Patterson. Needless to say a lot of books have moved with me over the years!! Whenever I move, I take most of my books. My bible of course, Ethan Fromme, The Red Tent, Memoirs of a Geisha, Reedeeming Love, All Torey Hayden’s books, and so many more!! Have a hard time parting with any of them. My childhood series of Little House on the Prarie books and my Nancy Drew series and a childhood favorite James and the Giant Peach and my favorite authors books Jodi Picoult, Kristin Hannah many more! I love books, I honestly have to save I pack probably too many with each move that I have made. But I do love to donate books also. I have moved way too many times. I take the time and carefully pack up all my books and take them with me. They are a part of me, they are my treasures! Haven’t moved for 20 years but when I do,I will be taking my books with me! I have many of David Baldacci, James Patterson, Nora Roberts, and I could go on and on! I’ve only moved once, but I made sure to take any classics, signed books, and and my Mary Higgins Clark Christmas-themed books. I am a Christmas junkie LOL! Lots of books on my Kindle Fire, so obviously those aren’t a problem at all. Thanks for the chance to win! Leaving books behind is like leaving part of wgo you are behind. So many different books help weave the tapestry of who we become. A house without books is …? just moved first time in 40 years. I had to downsize some but took my favorite authors with me!!! I haven’t moved for over 44 years, so I have gathered so many books that I love over the years. When it does come time to move next, I don’t know where I would start to keep just a few to come with me. My copy of Gone With The Wind (printed in two columns per page) and my copy of A Tree Grows In Brooklyn (with a price of 25 cents) have always been in where ever I have lived. Having moved several times I’v moved with a lot of books. My favourite books have to be my Sue Grafton A to Z series. My Nancy Drew Books, my very large hardcover copy of Children’s Nursery Rhymes(very sentimental), and To Kill A Mockingbird. When I moved I’ve taken my Ann Rice books, Stephen King, James Patterson, Leaves of Grass, assorted Shakespeare and many other books. Gone with the Wind, the entire James Bond series, Phyllis Whitney, Stephen King (except It! )…numerous others. You know we have moved many times & I always took a bunch of favourites – until a friend had a flood and lost all her stored books in the basement! Now I keep only some children’s books to pass on to my kids when they have kidlets & am happy to share what I read with book club members, friends, library & seniors library close by. My Steven King books move with me! I travel with books such as Anne of Green Gables, To Kill a Mocking Bird, Stephen King Books, Lord of the Rings Books, Harry Potter Books. I haven’t left my ‘The Handmaid’s Tale’ from the 80’s behind. I rented through 6 years of college so I moved frequently. My book collection always came with me. It’s a very large collection but a few that I could never get rid of was The Chronicles of Narnia, The Twilight series, Where the Sidewalk Ends, and many books on how to cartoon. My books are my treasures! When I moved from California back to Michigan to be near family, I couldn’t rake all my books. Among those that did move with me were ATLAS SHRUGGED by Ayn Rand, UNDER THE BANNER OF HEAVEN and INTO THIN AIR by Jon Krakauer, JOHN ADAMS by David McCullough, and ALL THE PRESIDENT’S MEN by Woodward and Bernstein. When I was about 6 or 7, my dad was in the military and bought me Alice in Wonderland while out on his travels. That book has moved everywhere with me! The Princess Trilogy by Jean Sasson traveled with me from India to NY. We moved here in ‘73. My most important books back then were my cookbooks. Every single one along with the cooking magazines made the journey! I’ve tried to always bring all of my books but I’ve lost some in other ways. Hurricane Katrina took most of my childhood books. My Harry Potter and Kim Harrison books have always made it though! We’ve moved many times, as my husband was active duty Army. I’ve always hung on to all of my favorite true crime books. They always helped to keep my mind occupied during his multiple deployments. I have moved almost 20 times in my life. I take all of my books. They are a part of who I am. My Nancy Drew collection; and my copy of Little Women!! I’ve never moved without them! All of my books make the move! It’s been so long since we’ve moved. I have various technical books. Harry Potter and Hitchhiker’s Guide To The Galaxy. (I know, not very interesting). I admit it, my wife reads more than I. My Little House on the Prairie books moved with me from TN, to MS, to NE, to CA, to GA. When I had the government movers in for my California to Georgia move my first question was if all my books would fall within my weight limit. I would have left behind some furniture before giving up books. I also knew it would be a while before everything would arrive in Georgia. So I had an apartment rented for two months and shipped two boxes of books by USPS so I would have books to read until the rest arrived. Oh my gosh, I’ve moved so many times but I still have my collection of Magic School Bus books, The Amazing Days of Abby Hayes series, Cam Jansen Mysteries, and Dear America books from my childhood. They make me feel so nostalgic! I unfortunately had to downsize about 4 moves ago and had to donate all of my books. I had 4 big plastic totes full. Good luck on your move. all my cookbooks and classic literature travels everywhere with me. I always take my favorite authors with me; Lee Child, Wilbur Smith, Jeffery Deaver, Diana Gabaldon, Ken Follett, plus others. I have moved quite a few times over the past couple years. I don’t have many books but I always take along with me my Harry Potter and hunger games series..
All of my books move with me. Everything from Dr Suess to family bibles. I find liquor store boxes are the best for packing books. They’re really strong and hold a good amount of books without being too heavy to carry. I take my travel books with me since we travel a lot. I have moved my Nora Roberts collection with me each move. The books that move with me always are my Sylvia Brown books and my Personal Support Worker books. I have several book cabinets with my most treasured books that moved with me several times. I’m saving them to re read when I’m too old to leave the house. We still have all our children’s books from when the kids were little, as well as multiple other ones like the Left Behind series. Besides family cookbooks and my dad’s classics collection, only novels I haven’t yet read move with me – as I read novels, I trade them with several friends, and when we are all done, they are donated to the local public library. The kids books are always first to be packed/unpacked. The Big Red Barn is still a favourite. All of my books go with me when I move. It’s a lot of boxes to move but I could never leave them behind . I always take the Dollanganger series by VC Andrews wherever I move. We’ve moved many times for my husband’s job. And my Agatha Christie collection has moved with us. I started collecting them over 40 years ago. Through my moves I have kept my CS Lewis, Douglas Adams, and Roald Dahl books! My collection to Stephen King novels has always travelled with me! Whenever I move I always take my whole collection! I never part with any of them! However, they make the worst books to move- they are so heavy! My favourite books are my Harry Potter series. I loved reading these with my children when they were little. I still have my kids’ Dr Seuss books after traveling as a military family for 24 years. My Harry Potter books went with me when I moved out of my parents home. I have many children’s book I read when I was little. I also do have many harry potter ones. In my youth it was always Stephen King. I had them all. In my later years it’s been Dan Brown, Maeve Binchy and of course Harry Potter. Oh and Beatrix Potter which now belong to my children. The book “Christy” by Catherine Marshall. It is a true story written about the author’s mother. It has touched me considerably and I have read it at least a dozen times. All of my books come with me! But my favorites are the mystery/suspense. As I read, will share the ones I can part with. So the ones left on my bookshelf is like old friends. They would be packed and move with me. Anything by Ann Rule, other true crime, The Bell Jar, Nursery rhymes. I never leave a book, behind. I have only moved twice in my lifetime but the books I needed with me at all times were Pride and Prejudice, Anne of Green Gables and Code Name Verity. Mostly I have had to live in places where i could put out only some of my books. I always have my Updike Rabbit books with me though. George Orwells 1984 has followed me through my entire life. I fell intrigued by this book as a teen and it has followed me through my whole life! Thanks for the giveaway! I have moved several times, including from Texas to Hawaii and back with my entire V.C. Andrews collection. I’ve had them since I was 16 and can’t part with them! Anne McCaffrey’s Dragonriders of Pern have travelled with me through my moves for decades! Just moved. Books still Packed. The Phantom Tollbooth! One of my favourite novels from when I was a kid! I love all types to bring with me but the classic The Old Man and The Sea when I am on the beach really makes me feel like I am in he book itself, fine story. I rarely move but when I last moved – 25 years ago – I brought all of my Margaret Atwood, Gabrielle Roy, L.M. Montgomery, Gore Vidal, James Clavell, Tolkein, and I forget who all else. Nowadays I would add in Louise Penny, Phil Rickman, and several other mystery writers. Mysteries are my favourite now, and cozy mysteries are my guilty pleasure! Thanks! All my old Pokémon books!! Harry Potter series, Ken Follett, and a few other gems. 1. Shogun – 1100 or pages of beauty and storytelling. It is an amazing book. 2. Slaughterhouse Five. Really it’s hard to go wrong with Vonnegut. 3. The entire Hitchhiker’s Guide to the Galaxy series. Those books have the perfect amount of sci-fi, contradiction, and mind-blowing. The ending is one of the saddest ever, though. My collection of JR Wards BDB series. Voices of the Heart by Barbara Bradford Taylor. I cannot read it enough. I have a Fannie Farmer cookbook that is over 30 years old, it is tattered, held together with elastic bands, dog-eared, a little sticky and full of notes to self. If I’m going it’s going with me! I always pack all my books when I move, but the one I take the most care with is my original edition of A Tree Grows in Brooklyn. I have traveled with all of my Stephen King books. I always give away my books — except, of course, the ones written by my friends! Shakespeare’s complete works has moved with me, from British Columbia, to NYC, and back home. Through theater school, and theater work. It will never leave my shelf! I’ve always lived in small places so space was limited for storing books. BUT, books that have made it to each move include the Harry Potter and Lord of the Rings series (because I’m saving them for my kids), The Tao of Pooh and a really old copy of Goodnight Moon. A Piece of Cake by Cupcake Brown all time fav! All my books traveled with me in my move. I have over 1000, my own mini library. I have everything from family bibles to the classics, to contemporary romances and thrillers! I have traveled to many a house with my Chicken Soup for the Soul collection. I now live in a small apartment and am a book junkie. From basement to attic in my house were stacked books. Some weird stuff travels with me: Marjorie Morningstar, everything by Margaret Atwood, Tales of the City, art books galore. And now a lot on Kindle. My favorite books that have survived several moves are Dostoyevsky The House of the Dead and McManus Positively Fifth Street. To Kill a Mockingbird is always with me when I move. When I went to college, I took my personal copy. During my freshman year, I participated in Dinner with a Dean and a group of us talked about To Kill a Mockingbird. We were provided with a new copy of the book and dinner that was loosely based on TKAM. The books that have traveled with me throughout life are the bible, various books from college that I use for reference books, some art books, and my Agatha Christie books. It’s hard for me to part with books that I think I may use again. Love reading, one of my favourite Canadian authors is Rick Mofina! Edward Rutherford’s London, Dublin and Sarum and Jane Austen’s Pride & Prejudice. I have moved 2 times and have always taken my favorite book, The Happiness Book written by Neil Pasricha such a great read and I could read that book over and over. I would always carry my Bible. My Harry Potter books will follow me everywhere! I’ve had my flowers in the attic books for over 30 years! A Tree Grows in Brooklyn has traveled with me since I was 14. I’ve taken my complete works of Shakespeare with me through every move! The copy belonged to my great-grandmother, who was an English teacher. My grandmother bequeathed me her collection of classics which contains everything from The Odyssey to Wuthering Heights to Shakespeare’s complete works to Huckleberry Finn. This along with the Bible, my assortment of cozy mysteries and my collection of childhood faves like Anne of Green Gables and Nancy Drew that I have kept for my daughters have made a number of moves with me. I have carried around Less than zero by Bret Easton Ellis for years (atleast 30) ….That’s probably the most well known book I have. I have lots of horror anthologies and true crime stuff. I also have a lot of books that have quotes and short stories that my grandmother left me…..I love all my books! My childhood favorites as well as all of the author signed copies I have accumulated over the years! I am not one who usually reads a book more than once but my copy of To Kill A Mockingbird has followed me around for all our moves and been read at least a half dozen times. My Bobbsey Twin books and Follow the River by James Alexander Thom. Isabel Allende daughter of fortune. I move all of my books with me. I struggle to let things go even if I won’t read it again. I cherish “The Borrowers” series from my childhood and like to re-read books by Mitchener. I have an absolutely enormous. massive library of books & they all move with me though sometimes many of them have to reside in storage lockers. However, every single one of the Pauline Kael books I keep right with no matter what! I haven’t moved for 32 years, but when I do, I will be taking my Jane Austen set with the gold edged pages that my son gave me when he was in high school. Also, I wouldn’t leave without Better Homes and Gardens or Canadian Living cookbooks, which are stalwarts for everyday recipes, such as scones, pies, crumbles. really very great full guy’s especially all of us nice,little woman anden I need a bible book ,i love that book because talking about Jesus thank you. I have moved with just a few of my favorites … The Promise by Danielle Steel, and She’s Come Undone by Wally Lamb to name a couple! Childhood books with nursery rhymes and later in life self help books. Arlene Dickinson, Jim Trevling, Weatlhty Barber they were all very good reads. I traveled with some books I had as a kid although I cannot recall the names. I also brought some of my son’s favorites like Brown Bear, Goodnight Moon, Love You Forever. Since my last move I have rediscovered the love of reading myself and have put several books away to keep with me. They are, Pride and Prejudice, Wicked, The Book Thief, The Almond Tree and several others. My Stephen King collection (everything he has evr written!) My Neil Gaiman collection (ditto) and White Fang by Jack London. I must have the Count of Monte Cristo, The Scarlet Pimpernel and Sherlock Holmes with me. My books have traveled with me through 19 moves and I’ve still got childhood favorites on my shelves like classics from Robin McKinley and Terry Brooks. When I was moving I had so many books I sat and sorted. I took most of them but gave a good amount to a donation station nearby. All of my books have travelled with me thru all of my moves, I love books and keep them all. Happy to share them and read them again myself! I even still have some of my childhood favourites like Anne of Green Gables, Tom Sawyer and Black Beauty. My Jane Austen collection always comes with me! My collection of Pearl S Buck books comes with me. And my Christy book by Catherine Marshall and my Bibles. i really don’t like to keep books after I read them. I keep my Bible and a few reference books but other than that I read and then pass along. When we sold our house last June, we weren’t closing on our new home for three months. We lived in two different rental houses during that time, and to help me with the stress of moving three times in just over three months, I brought all my Kent Haruf books (all of the books he ever wrote). His writing always helps to take me away from my problems. Jeffrey Deaver, Lee Child & Dan Brown books my favorites. My Happy Hollister series, Little House on the Prairie series, The Little House, Christy and Julie by Catherine Marshall. All of these I’ve had for YEARS! The children’s books I read when I was a kid and enjoy just as much as an adult. I have to say it’s my history books. I have always had a book by Bronte, Jane Eyre with me during most of my moves. I have loved that novel since I was a tween. I may not have the same book, but I have the novel. My children’s classic books have moved with us, as has a copy of NIGHT by Elie Wiesel, some of my high school and university books, books about the art of writing….all have found themselves at new addresses with us. I have moved at least 9 times and have always brought approx. 350 with me. Always, always, always, through many moves over the last 60+ years, “Mrs. Mike” has come with me! Siddhartha has moved with me since high school. I’ve moved five times in my adult life. My first “grown up book”- Gone With the Wind- has always come with me. My collection of Margaret Atwood books- including a signed copy -always move with me and have been added to over the years. My collection of Russian history books and my and my husband’s collection of American Civil War books always move, too. Lord of the Rings travels with us. My Stephen King books and my “Gone with the Wind” and the sequel are really the only books I have kept. Although, now that I think of it, I believe I still have all my Sweet Valley High books from Junior High School too! Between my husband and me it would be nearly impossible to list all of the books that have moved with us. We have moved three times. In our library we have many interesting cookbooks, and several Bibles. My library is very different from my husband’s. I prefer fiction, crime dramas mostly. He prefers non-fiction, autobiographies, fly-fishing, and how-to books. My Tolkien collection has made every move I have ever made. I always bring my Dr. Seuss collection with me! I always have my Little House on the Prairie series and Harry Potter series. My rugged copy of The Dog Who Wouldn’t Be along with my JRR Tolkien collection have followed me. I collect signed first editions, but, unfortunately lost some of them in a break in. Even though they were covered by insurance, I would rather have the books back. At least my signed Charlton Heston and Pierre Trudeau books are still with me as I build my collection again. I’ve moved all my books. I can’t bear to leave them. Some of my favorites include a copy of ‘Gone With The Wind’ from my teenage years and a boxed set of ‘The Chronicles of Narnia’ from my childhood. When i a kid i had the Hardy Boys collection, Roald Dahl , Mark Twain, Stephen King, i tried to move as much of them as i could but the one thing that seems to always get left behind is books. I used to donate my books to the library and then would always end up taking more home. I have never left any books behind. I have moved a number of times and each of my books has come along with me. From Joyce Carol Oates to Kurt Vonnegut and many more, they are all keepers! My Narnia and Wrinkle in Time books from when I was a kid and all the books in the Outlander series! We moved recently, and it was a struggle to decide which books to let go. Books are like old friends. I brought my Dan Brown books, Deepak Chopra, Daniel Amen, books about Health, Travel and wildlife. I have a boxed set of the Chronicles of Narnia that I’ve had since I was six. College, first apartment, first house, all the way to my current home, these books have made the trip with me. When I moved from my home state I brought all my books with me. I still have my collection of Dr. Seuss books from when I was a baby. Books that I don’t love usually get donated to the local friends of the library chapter. My most cherished collection of books that have traveled with me include books written by Toni Morrison and Maya Angelou. My childhood beloved classics by Judy Blume and Beverly Clearly are also still part of my cherished collection of books. “Oh Baby! a survival guide” was during my huge move while I was pregnant. Since then with smaller moves, I have kept books close like, “Forsaken”, “Nancy”, and “Two by Two”. Thanks so much for the chances to win. Any Stephen King has helped me through moves, under the dome, gunslinger series, now I’m reading the collaboration with his son. My book collection has always come with me. This is such a timely contest for me, as I have packed up my books to move. I keep all travel books, reference books and my Agatha Christie books. Definitely all the works of Jane Austen. Twilight series, Harry Potter series, Alice in Wonderland, and the Narnia series. So many books. I haven’t moved in the past 20 years but the books that followed me when moving from Europe to Canada many years ago were my childhood books, many by Astrid Lindgren. I still have them and would find it difficult to part with. I have a wide range of likes. As a teacher, I loved books like Huckleberry Fin, To Kill a Mockingbird, and Frankenstein. As a child, I loved Charlie and the Chocolate Factory. As a high school student, I was fascinated with any stories by Edgar Allan Poe. As a home owner, I love interior decorating books by a wide variety of authors. I also love books on budgeting and self-improvement. These are the types of books that would go with me if I ever decided to move again. 4 Hour work week, Hunger Games. All my Danielle Steel books always move with me. My Harry Potter & Lord of the Rings series. The JK Rowling Harry Potter Series has come with us. Classics to hand down from my children to my grandchildren. I am always traveling with the military but my books of Harry Potter, Jane Eyre, and my collection of books by C. S. Lewis are always traveling along side of me. I have moved 17 times and we are moving again this spring, I always take my old copies of The Lion the Witch and the Wardrobe, The Wizard of Oz and the Stand. all my books in a building fire a year and a half ago. OH, there are a few of them. The Outsiders by S.E. Hinton, Behind the Attic Wall by Sylvia Cassidy, and Breathing Lessons by Anne Tyler. All my books come with me such as A child called in, The Prince of Thieves and The Secret to name a few. I’ve always just brought them all with me, every time … “all” being an increasing integer with each successive move. The worst move ever was the last one I made: after a house fire. I lost all of my books! How to survive? I go to gutenberg.com to read the classics… and oh, what friends i have made with the local (sadly very small) library! For cookbooks there are search engines … but it is hard to beat the look, the smell, the feel, and the memories associated with your own books. …Slowly you build your personal library up again. The printed word becomes so precious you grasp at anything to hold a real, bound book… some of them books you would have never allowed across the threshold before! You find quality and deep meaning in the pulp novels that coworkers bring to work, stealthily dropping them off in the breakroom because they can’t give them away. In a slow, excruciating development, your once-elegant book snobbery has been replaced with book desperation, the sort of fanaticism that people associate with other completely unrelated traits, like having too many cats or doilies, or a fondness for tea (properly prepared). They smile a little sadly, a little pityingly, when they think you can’t see. You do see, but you don’t care, because they bring a box of Just Some Old Books We Don’t Read Anymore. God bless them! The Earth’s Children Series by Jean M. Auel, Schoolgirl honour by Kathlyn-Rhodes, Sing You Home by Jodi Picoult plus the hundreds of other books I treasure. I’ve always brought all my books with me. But I haven’t moved in 30 years so the next move would involve hundreds of books. I always have some biographies handy. I love to have a full shelf of books throughout my moves. I even kept my texts from university. I haven’t moved in 30 years, but I still have my old Chronicles of Narnia books, The Magician’s Nephew is my fave. I have lots of my old books. I also have the Secretary Desk my mother had with her Book of the Month Club books in the cabinet. I love reading ..Have mostly kept Book Series and Classics and some Advanced Reading Copie’s I have won from Goodread’s .. I purge my shelf at least twice a year to make room for new Books !!! I move with at least all of our hardbound / hard cover books. I try to donate all of our trade paperback books when we move. I make sure to bring all my Harry Potter books when we move. I brought 95% of my books with me during our last move & we don’t have the storage space. Now I need to purge some. I’m never going to leave my Harry Potter collection and some personal favorites as I was growing up like “Why We Broke Up” by Lemony Snicket’s alias. I used to take my Healthcliff book to Italy frequently. I always move all my favorites, such as, Little house on the prairie, Anne of green gables, James Patterson, my cook books and gardening ones. Thanks! I always have the book “Johnny Got His Gun” with me wherever I have moved to in my life. Always Pride and Prejudice, and lately, Sender Unknown. My Bible and My Almanac Of American Politics have moved with me. The Secret Garden will. Always be in my collection. I have always brought with me my collection of Stephen King novels. I’ve grown to have one copy of each, including the short story collections and those written as Richard Bachman. I also now always bring Conversations With God. Finally, I have fallen for and now bring from location to location J.K. Rowling’s beautiful Harry Potter series. It’s my childhood books that never leave my site through a move – The Phantom Tollbooth, Just Only John and Something Queer is Going On.